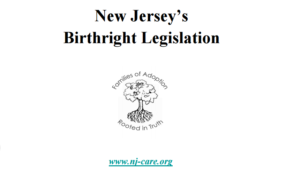 Since 1980, we have been advocating for New Jersey-born and/or adopted persons to have the right to receive a copy of their original birth certificate upon request. A bill passed in both houses of the New Jersey Legislature in February 2014. It was amended by the governor and signed into law on May 27, 2014. It will take effect on January 1, 2017. 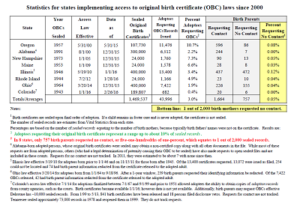 Why is it important for adopted persons to have their original birth certificate? Adoptees are barred access to their medical history. 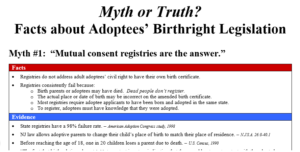 Adoptees have a civil right to know personal information about themselves, the same rights as non-adopted individuals. Adoptees are excluded from knowing their heritage and ethnic origins. Many large organizations supported the bill. • Children born out-of-wedlock had “illegitimate” stamped on their birth certificates. • Social workers and lawmakers believed that members of the triad needed protection not only from the prying eyes of the public, but from one another. • Secrecy and denial were accepted as the norm. • The awareness of the theory of nature vs. nurture was in its infancy, and genetic research was almost nonexistent. Here is some of the information we compiled and used to prove open access is irrefutably a human rights issue. Number of sealed records opened in 8 states. Number of birth parents who requested no contact. 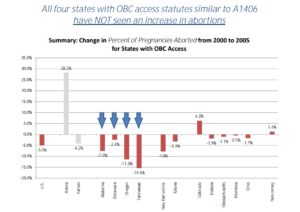 Compiled from states who have implemented open access laws since 2000. Opening Day - Stay tuned! Details to come! Stay connected to us.